The Presidential Scholars Competition is designed for *qualified high school seniors to compete for full-ride scholarships. 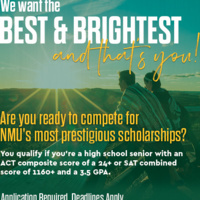 In addition to 10 full ride (tuition plus room and board) scholarships and 10 full-tuition scholarships, approximately 200 scholarships of $1000-$2000/yr amounts will be awarded to participants. Participants may also choose to compete for one of ten leadership scholarships. *Students are qualified to register if their cumulative high school GPA as of the end of the junior year is at least 3.50 on a 4.0 scale AND the ACT composite score is 24 (or SAT combined score in math and critical reading is 1160) or higher.